Going out to eat is about more than just the food, it’s about the experience. After all, diners take in your restaurant’s ambiance long before they take their first bites. The first thing we all do when entering a restaurant is to scope out the aesthetics. Because of this, it is critical that the restaurant provides a good first impression. Having a great ambiance will encourage patrons to enter, stay longer, eat and drink more and ultimately increase profitability for your restaurant. So, how do you know what’s right for you? We’ve done the research and compiled a list of helpful tips for creating an atmosphere that will enhance the dining experience at your restaurant to increase profits. The old saying tells us to avoid judging a book by its cover. But, we can guarantee people will judge your establishment by how it looks from the outside. Make it attractive! Start with a prominent sign out front. The concept of your restaurant will determine what style you should go with. Maybe you’ll have a custom sign made from old barn wood or maybe you’ll flash some neon. Let’s face it, today everyone is documenting their every move on social media. If you have an appealing sign introducing your restaurant, people will photograph themselves in front of it. Consider adding a cool focal piece that they’ll want to have an “Insta” shoot in front of. Murals, giant Adirondack chairs, even bicycles are all elements that people will want to snap a photo with. Toro Loco in NYC has a Mexican Day of the Dead theme and incorporates pink as their pop of color. They placed a pink bicycle outside of the front door and it became an attraction for guests. These easy additions can become your trademark and all those social posts are free advertising for you. If guests geotag your location in their post, followers can easily navigate to your own social account. Interested in learning more about Geotagging and what it can do for your business? Join our webinar on Wednesday, August 15th. Having outdoor seating or a patio is another good way to look attractive from the outside. If people can see and appreciate your concept even before they enter, it will make them more likely to come in and see what you’re all about. Do you have a bar as part of your restaurant concept? Having a bar inspires people to spend both more money and time at your establishment. If you are an upscale restaurant, having a 10-12 seat bar will allow people to enjoy a drink or two before they sit down for their meal. If your dining floor is busy, having a bar helps patrons pass the time while waiting for a table to become available. The bar area can create an ambiance of its own. It should be attractive, clean, and well-stocked. Everyone who has gone out to eat has experienced both restaurants that are too dark or too bright for their liking. Getting the lighting right is important to guests. Just because we all have cell phones doesn’t mean we want to squint over a menu using the flashlight feature. Like the ideal music, the ideal lighting for your restaurant depends on the style of the restaurant. Low lighting creates a relaxing and comfortable atmosphere that encourages diners to really savor their food while bright lighting helps increase customer turnover (perfect for midday rush). It is crucial that a restaurant finds the proper lighting to appeal to their customers. Determine the mood or the concept you want to achieve and then match it with the lighting. A romantic setting should be dimly lit. Try a nice chandelier or incorporate candles. If you run a fast-casual concept, use natural light through big windows (with adjustable shade options), or try a bright, upbeat color scheme. Finding the proper lighting will set the tone for your restaurant. Lighting isn’t only essential for the guest experience during the meal. As we mentioned above, people want to take photos of their experience! When it comes to photo lighting, some restaurants are going to great lengths to ensure their customers get the perfect photos. The second branch of steakhouse Boston Chops that opened this year features a special “Instagrammers’ table” complete with moveable, adjustable lights ideal for photos. Listen to the music! Research has shown that diners are willing to spend the least money at restaurants that don’t play music, so a silent or music-less restaurant can be detrimental to sales. However, not all music is created equal. Different styles of music work best at different types of restaurants, so you probably shouldn’t just play your personal favorites unless they fit well with the vibe of your restaurant. Studies have shown that people eat at the speed of the music being played. In other words, they spend more time at restaurants (and, as a result, increased the bill) when slow music is being played and less time in restaurants when fast music is being played. If you’re a sit-down restaurant where customers like to sit and talk and often order additional courses like dessert, slower music is a good choice. If you’re a fast-casual restaurant that prioritizes customer turnover, fast music is probably your best bet. Just make sure the mood is right for the food! Don’t bring in the Elvis impersonator to your upscale steakhouse. Figure out your concept and demographic and choose your music based upon that. When it comes to music, live bands are also an option to consider. There are sultry jazz singers, reggae bands, even old school pianists to choose from. To read more about how to build the perfect restaurant playlist, check out our guest blog post. A restaurant’s sound doesn’t just come from the music being played. Whether it be music, laughter, noise from the kitchen, or the sound from a television, you want to make sure you’re cognizant of what’s happening in your establishment. Keep the hustle and bustle of the kitchen confined to that area so you’re not disturbing your guests. Listen to customers’ requests to lower TV volume. Keeping your guests happy is the priority, so keep in mind that there needs to be room for adjustments. Also, remember to consider the ceiling heights and the acoustics of your space. The colors in your dining room influence diners more than you might realize. For example, red increases blood pressure and heart rate which in turn increases hunger. This is thought to be evolutionary, as red signaled energy-dense, sugar-packed fruits and vegetables to our hunter-gatherer ancestors. Orange and yellow are appetite stimulants too. Orange increases mental activity and gets customers thinking about healthy food and yellow makes customers happy, thereby improving the overall dining experience. Red, orange, and yellow are all good choices for decor. Be advised though, red plates have been shown to cause diners to eat less. 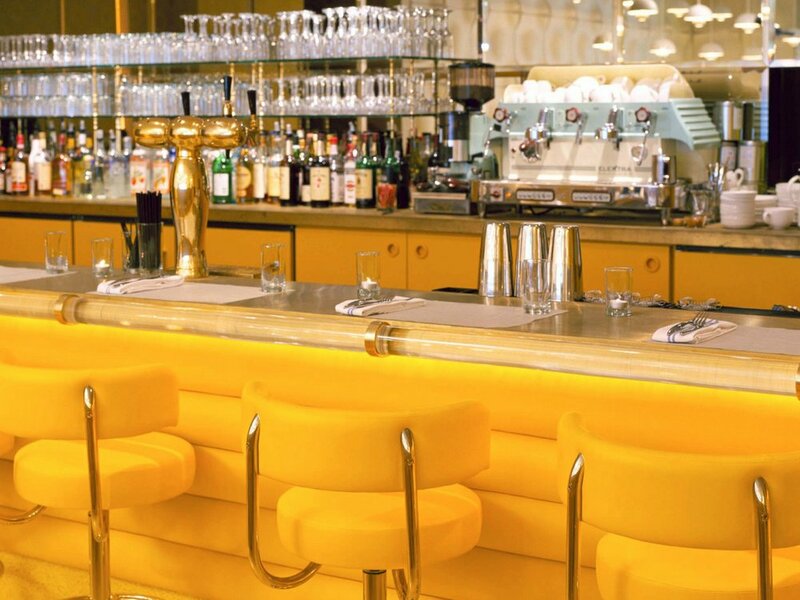 The yellow decor at 24/7 Restaurant at The Standard in Los Angeles creates an upbeat ambiance. You may want to avoid using a lot of gray, black, brown, purple, and blue because those colors are known appetite suppressants. Gray repels us from the thought of food; black diminishes our appetites; brown reminds us of burnt food; purple is associated with unpopular foods like eggplant and blue makes us sleepy and can slow our metabolisms. Having appealing music and lighting is key, but your staff interacts with your guests. They are the ones who bring the energy and excitement to your restaurant. Your servers should be welcoming and helpful. Have them recommend dishes and be open to answering any and all questions about a menu item/drink. Enthusiasm sells! At the same time, they should also avoid the practices diners consider annoying. Make sure your staff wears proper uniforms or attire to match your restaurant’s concept. They’re a direct reflection of how you want to present your restaurant to diners. Of course, t-shirts and shorts are unacceptable uniforms for a fine dining establishment, but they might work perfectly for a sports bar. Some restaurant concepts call for a different type of staff behavior. Take Ellen’s Stardust Diner for example. They are known for their Broadway-themed dining experience, so servers entertain guests with renditions of Broadway classics. This isn’t typical staff behavior, but it works for them. Find what works for your restaurant and run with it! As a restaurant owner, it is vital to create the proper ambiance of your establishment. Customers who feel comfortable dining with you will want to keep coming back for more. Having a positive experience will ensure that people recommend your restaurant to others. Create a buzz! Word of mouth and social media combined will be two of your most powerful means of advertising. Capitalize on this by laying the groundwork with factors that extend beyond the meal itself. Look around and make sure you have “set the table” with all the right ingredients.